Microorganisms help to drive a number of processes that recycle energy and nutrients, including elements such as carbon, nitrogen, and sulfur, around the Earth's ecosystems. Viruses that infect microbes can also affect these cycles by killing and breaking open microbial cells, or by reprogramming the cell's metabolism. However, as there are many different species of microbes and viruses —the vast majority of which cannot easily be grown in the laboratory— little is known about most virus–host interactions in natural ecosystems, especially in the oceans. In the world's oceans, the concentration of oxygen dissolved in the water changes in different regions and at different depths. ‘Oxygen minimum zones’ occur globally throughout the oceans at depths of 200–1000 meters, and climate change is causing these zones to expand and intensify. Although a lack of oxygen is sometimes considered detrimental to living organisms, oxygen minimum zones appear to be rich with microbial life that is adapted to thrive under oxygen-starved conditions. Sulfur-oxidizing bacteria are one of the most abundant groups of microbes in these oxygen minimum zones, and several of these bacteria are known to influence the recycling of chemical substances. Now, Roux et al. introduce a new method to identify viruses that infect the microbes in this environment, including those microbes that cannot be grown in the laboratory and which have previously remained largely unexplored. The genomes of 127 individual bacterial cells —collected from an oxygen minimum zone in western Canada— were examined. Roux et al. estimate that about a third of the sulfur-oxidizing bacterial cells are infected by at least one virus, but often multiple viruses infected the same bacterium. Five new genera (groups of one or more species) of viruses were also discovered and found to infect these bacteria. Looking for these new viral sequences in the DNA of this oxygen minimum zone's microbial community revealed that these newly discovered viruses persist in this region over several years. It also revealed that these viruses appear to only be found within the oxygen minimum zone. Roux et al. uncovered that these viruses carry genes that could manipulate how an infected bacterium processes sulfur-containing compounds; this is similar to previous observations showing that other viruses also influence cellular process (such as photosynthesis) in infected bacteria. As such, these newly discovered viruses might also influence the recycling of chemical elements within oxygen minimum zones. Together, Roux et al. 's findings provide an unprecedented look into a wild virus community using a method that can be generalized to uncover viruses in a data type that is quickly becoming more widespread: single cell genomes. This effort to understand virus–host interactions by looking in the genomes of individual cells now sets the stage for future efforts aimed to uncover the impact of viruses on bacteria in other environments across the globe. Microbial communities are critical drivers of nutrient and energy conversion process in natural and engineered ecosystems (Falkowski et al., 2008). In the last two decades, it has progressively become clear that viral-mediated predation, gene transfer, and metabolic reprogramming modulate the structure, function, and evolutionary trajectory of these microbial communities (Suttle, 2007; Abedon, 2009; Rodriguez-Valera et al., 2009; Hurwitz et al., 2013). At the same time, the vast majority of microbes and viruses remain uncultivated and their diversity is extensive, so that model system-based measurements rarely reflect the network properties of natural microbial communities. While culture-independent methods, such as metagenomics and metatranscriptomics, can illuminate latent and expressed metabolic potential of microbial (Frias-Lopez et al., 2008; Venter et al., 2004; Stewart et al., 2012; DeLong et al., 2006) or viral communities (Angly et al., 2006; Hurwitz et al., 2013; Mizuno et al., 2013), interactions between community members remain difficult to resolve. Clustered regularly interspaced short palindromic repeats (CRISPRs) containing short stretches of viral or plasmid DNA separated between repeat sequences can provide a record of past infections in uncultivated microbial communities. Together with associated Cas (CRISPR-associated) genes, CRISPRs function as an adaptive immune system in prokaryotes with the potential to suppress viral replication or horizontal gene transfer (Sorek et al., 2008). However, an application of CRISPR-based virus–host association to both uncultivated hosts and viruses require the assembly of complete or near-complete genomes of both entities, limiting their utility to lower diversity ecosystems (Andersson and Banfield, 2008; Anderson et al., 2011). Alternatively, single-cell amplified genome (SAG) sequencing is emerging as a more direct method to chart metabolic potential of individual cells within microbial communities with special emphasis on candidate phyla that have no cultured representatives (Yoon et al., 2011; Martinez-Garcia et al., 2012; Rinke et al., 2013; Swan et al., 2013). Here, we combine metagenomic and single-cell genomic sequencing to explore virus–host interactions within uncultivated bacteria inhabiting a marine oxygen minimum zone (OMZ). Marine OMZs, defined by dissolved oxygen concentrations <20 μmol kg−1, are oceanographic features that arise from elevated demand for respiratory oxygen in poorly ventilated, highly stratified waters. OMZs are crucial for biogeochemical cycles in the global ocean, as they represent hotspots for microbial-driven carbon, nitrogen, and sulfur transformations (Ulloa et al., 2012; Wright et al., 2012) and play a disproportionate role in nitrogen loss processes and greenhouse gas cycling (Lam et al., 2009; Ward et al., 2009). Moreover, these zones are expanding due to changing ocean water temperatures and circulation patterns (Stramma et al., 2008; Whitney et al., 2007). Given these changing physical and chemical conditions and the importance of OMZs to ocean-atmosphere functioning, a clearer understanding of biological responses is critical to develop a much-needed predictive modeling capacity for OMZs. In OMZs, microbial communities drive matter and energy transformations and are typically dominated by sulfur-oxidizing Gammaproteobacteria related to the chemoautotrophic gill symbionts of deep-sea clams and mussels (Stewart et al., 2012; Wright et al., 2012). Phylogenetic analysis indicates that these bacteria are comprised of two primary lineages; one consisting of sequences affiliated with SUP05 and clam and mussel symbionts, and the other consisting of sequences affiliated with Arctic96BD-19 (Walsh et al., 2009; Wright et al., 2012). Both groups partition along gradients of oxygen and sulfide, with Arctic96BD-19 most prevalent in oxygenated waters and SUP05 most prevalent in anoxic or anoxic/sulfidic waters (Wright et al., 2012). Niche partitioning between SUP05 and Arctic96BD-19 is driven by complementary modes of carbon and energy metabolism that harness alternative terminal electron acceptors. While both Arctic96BD-19 and SUP05 use reduced sulfur compounds as electron donors to drive inorganic carbon fixation, SUP05 manifests a more versatile energy metabolism linking carbon, nitrogen, and sulfur cycling within OMZ and hydrothermal vent waters (Canfield et al., 2010; Zaikova et al., 2010; Swan et al., 2011; Stewart et al., 2012; Anantharaman et al., 2013; Mattes et al., 2013; Anantharaman et al., 2014; Hawley et al., 2014). Ocean viruses, predominantly investigated in the sunlit or photic zone, are abundant, dynamic, and diverse (Suttle, 2005) with growing evidence for direct roles in metabolic reprogramming of microbial photosynthesis, central carbon metabolism, and sulfur cycling (Mann et al., 2003; Lindell et al., 2005; Clokie et al., 2006; Breitbart et al., 2007; Dammeyer et al., 2008; Sharon et al., 2009, 2011; Thompson et al., 2011; Hurwitz et al., 2013). Preliminary studies suggest that similar patterns are emerging in OMZ waters. In the Eastern Tropical South Pacific, a metagenomic survey revealed specific viral populations endemic to OMZ waters (Cassman et al., 2012). Consistent with most viral metagenome surveys, approximately 3% of sequences were affiliated with functionally annotated genes in public databases. From a nitrogen and sulfur cycling perspective, viromes from the oxycline contained genes encoding components of nitric oxide synthase, nitrate and nitrite ammonification, and ammonia assimilation pathways as well as inorganic sulfur assimilation (Cassman et al., 2012). In anoxic waters, viromes contained genes encoding components of denitrification, nitrate and nitrite ammonification, and ammonia assimilation pathways as well as sulfate reduction, thioredoxin-disulfide reductase, and inorganic sulfur assimilation (Cassman et al., 2012). More recently, metagenomic analyses of hydrothermal vent plume microbial communities dominated by SUP05 bacteria-enabled phage genome assemblies presumed to infect SUP05 (Anantharaman et al., 2014). Consistent with viruses encoding auxiliary metabolic genes (AMGs, Breitbart et al., 2007) enabling viral reprogramming of microbial metabolic pathways (Lindell et al., 2005; Thompson et al., 2011), putative SUP05 phage contained genes encoding reverse dissimilatory sulfite reductase A and C positing a role for viruses in modulating the marine sulfur cycle (Anantharaman et al., 2014). Given that SUP05 and Arctic96BD-19 play key roles in OMZ ecology and biogeochemistry, we designed an approach to target SUP05-associated viruses in a model OMZ ecosystem, Saanich Inlet a seasonally anoxic fjord on the coast of Vancouver Island, British Columbia, Canada. We obtained a SUP05 single-cell genomic data set spanning defined redox gradients in the Saanich Inlet water column, identified SUP05-associated viruses infecting SAGs, and used resulting virus–host pairs as recruitment platforms to estimate viral diversity, activity, dispersion, and potential impact on SUP05 population dynamics and metabolic capacity. The resulting data sets open an unprecedented window on uncultivated virus–host dynamics in OMZs and provide an analytical approach extensible to other natural or engineered ecosystems. SUP05 SAGs were generated at the Bigelow Laboratory for Ocean Sciences (http://scgc.bigelow.org, [Stepanauskas and Sieracki, 2007; Swan et al., 2013]). 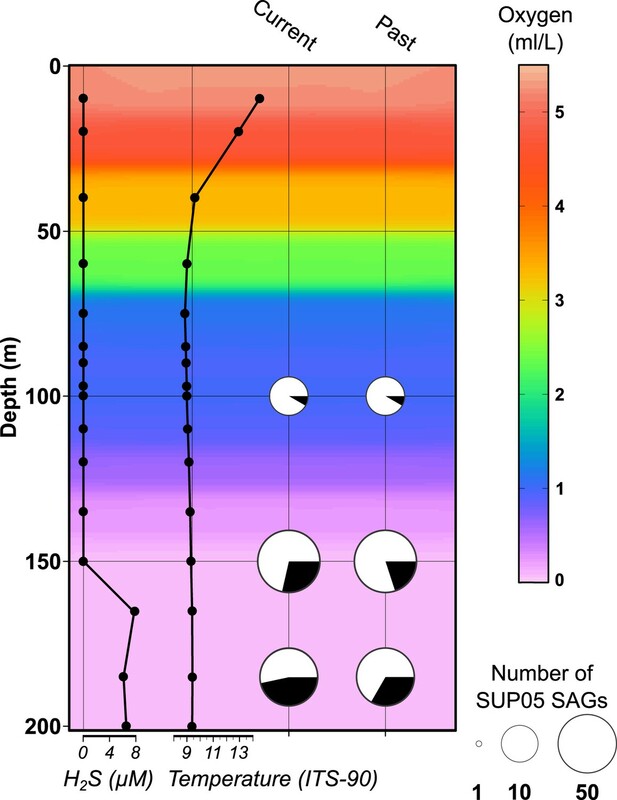 Briefly, fluorescence-activated cell sorting was used to separate individual cells <10 µm in diameter from 100, 150, and 185 meters water depth, spanning water column gradients of oxygen and sulfide in Saanich Inlet (Figure 1—figure supplement 1). Water column redox conditions were typical for stratified summer months when SUP05 populations bloom in deep basin waters. 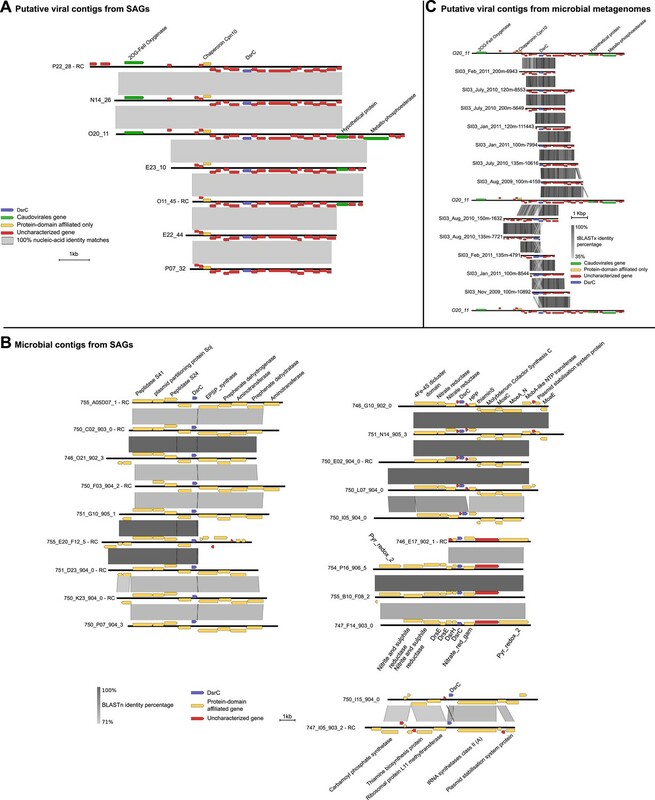 A total of 315 anonymously sorted cells (discriminated solely using fluorescence and size for sorting) per depth interval were subjected to multiple displacement amplification (MDA), and the taxonomic identity of single amplified genomes (SAGs) was determined by directly sequencing bacterial small subunit ribosomal RNA (SSU rRNA) gene amplicons. SAGs affiliated with SUP05 (n = 127) and Arctic96BD-19 (n = 9) populations were subsequently whole genome shotgun sequenced on the Illumina HiSeq platform. Most (113/127) SUP05 SAGs fell into two major operational taxonomic units (OTUs) or subclades, based on SSU rRNA gene sequence clustering at the 97% identity threshold—SUP05_01 (n = 65) and SUP05_03 (n = 48) (Figure 1—figure supplement 2). SUP05_01 SAGs were recovered at 100, 150, and 185 meters, peaking at 150 meters, while SUP05_03 SAGs were more evenly distributed between 150 and 185 meters. A number of SUP05 SAG assemblies contained viral contigs consistent with sampling infected cells across the redoxcline. 50 bona fide viral contigs (Supplementary file 1, ‘Materials and methods’) were identified in 30 SUP05 SAGs using viral marker genes, hereafter termed ‘hallmark genes’ (Abrescia et al., 2012). SUP05 viral contigs were affiliated with known families of Caudovirales (dsDNA) and Microviridae (ssDNA) bacteriophages. The presence of Caudovirales is not surprising as they are commonly observed in oceanic samples (Williamson et al., 2012; Hurwitz and Sullivan, 2013), including the ETSP OMZ and SUP05-dominated hydrothermal vent plumes (Cassman et al., 2012; Anantharaman et al., 2014). Microviridae, however, are usually observed in surface seawater or deep-sea sediments and have not been previously associated with OMZs (Angly et al., 2009; Tucker et al., 2011; Yoshida et al., 2013; Labonté and Suttle, 2013b). Given the SUP05 lineages described above, we note that viral contigs recovered from SUP05_01 SAGs were exclusively Caudovirales, whereas SUP05_03 SAGs contained both Caudovirales and Microviridae. Using non-reference-based methods, an additional 19 contigs were identified as putative viral sequences. These sequences did not encode hallmark genes, but displayed genomic characteristics consistent with novel viral genomes including a low ratio of characterized genes (i.e., most genes predicted on these contigs do not match any sequences from the reference databases), a high number of short genes, and a low number of strand changes between two consecutive genes (i.e., gene sets tend to be coded on the same strand; ‘Materials and methods’, Figure 1—figure supplement 3). In total, 69 viral contigs encoding 898 predicted open reading frames over 529 kb were recovered from SUP05 SAGs representing current viral infections. Forty-two out of 127 SUP05 SAGs sequenced contained one or more viral contigs (Figure 1—source data 1), indicating that ∼1/3 of SUP05 cells inhabiting the Saanich Inlet water column were infected by viruses. Such lineage-specific infection frequency determination is unprecedented in uncultivated or cultivated host cells and is largely consistent with community-averaged estimates for marine bacteria (Suttle, 2007). As with all the other means to estimate infection frequency and viral-induced microbial mortality (Brum et al., 2014), there are caveats to these numbers including underestimation linked to incomplete identification of viruses in the SAG data sets. Such an underestimation could result from (i) lack of reference genomes, (ii) incomplete SAG genomes, (iii) early infections not being detected prior to genome insertion and replication, or (iv) late infections not being detected due to phage-directed degradation of host DNA preventing 16S identification during the SAG selection process. Since the infection frequency estimates are largely consistent with community-based measurements, we expect that these biases are small. SUP05 viral infections showed strong depth partitioning along defined gradients of oxygen and sulfide (Figure 1). At 100 meters a single SUP05 SAG (of 12) displayed current viral infection, while the percentage of infected SUP05 SAGs increased to 28% and 47% at 150 and 185 meters (Figure 1—source data 1). Consistent with previous studies evaluating community-averaged lytic viral activity (Weinbauer et al., 2003), cell-specific lytic viral infection estimates peaked where SUP05 is typically most abundant and metabolically active in the Saanich Inlet water column (Hawley et al., 2014). Additionally, remnants of past infections were detected in SUP05 and Arctic96BD-19 SAGs, including 13 putative prophages and 25 CRISPR sequences (Supplementary file 2). None of these ‘past infection’ sequences match the detected ‘current infection’ viral contigs. Saanich Inlet water column characteristics and SUP05 infection frequency on the SAG sampling date (August 2011). Key abiotic measurements are represented as background coloring (oxygen levels) and black lined graphs at left (hydrogen sulfide and temperature). SUP05 viral infections determined from 127 SAGs are indicated at right by black slices in pie charts where current infections were delineated from intact viral contigs and past infections were inferred from identification of defective prophages and CRISPR loci. To better understand the ecological and evolutionary forces shaping SUP05 virus–host interactions in Saanich Inlet, we focused on 12 viral reference contigs including 4 Caudovirales contigs longer than 15 kb (from 3 Podoviridae and 1 Siphoviridae) and 8 complete genomes of Microviridae. Genome organization (Figure 2) and phylogenetic analysis (Figure 2—figure supplement 1) revealed that all four Caudovirales contigs represent new genera (share <40% of their genes, Lavigne et al., 2008, Figure 2—source data 1) even when considering the viruses recently assembled from SUP05-dominated microbial metagenomes (Anantharaman et al., 2014). All 8 Microviridae contigs shared 100% nucleotide identity, despite their recovery from different SUP05_03 SAGs (Supplementary file 3), and represent a new genus within the subfamily Gokushovirinae (Figure 2—figure supplements 2 and 3). These identical Microviridae genomes could represent a lineage-specific viral bloom, targeting the SUP05_03 subclade. SUP05 infection by Gokushovirinae extends the known host range from small parasitic bacteria (namely Chlamydia, Bdellovibrio and Spiroplasma) to include free-living Gammaproteobacteria, the first marine host identified for this subfamily of viruses (Labonté and Suttle, 2013a). Genetic map and synteny plots for the four references SUP05 Caudovirales contigs M8F6_0 (A), C22_13 (B), K04_0 (C) and G10_6 (D) (highlighted in bold). Viral hallmark genes are underlined and identified on plots (MCP: major capsid protein, Sc: scaffolding protein, H-T conn.: head-tail connector). Sequence similarities were deduced from a tBLASTx comparison. For clarity sake, several sequences including SUP05 viral contig M8F6_0, K04_0, and G10_6 are reverse-complemented (noted RC). Curiously, most (11 of 12) Microviridae-infected SUP05_03 SAGs also contained Podoviridae contigs (Supplementary file 4). While previously postulated based on comparative genomics, lineage-specific co-infection between the ssDNA Microviridae and dsDNA phages has not been observed (Roux et al., 2012). Such highly correlated co-occurrence in SUP05 SAGs (Fisher exact test p-value = 2e−15) is consistent with non-random co-infection. This could be linked to cooperative infection modes between viruses or opportunistic infection of cells already infected by the other virus type, as seen in the case of satellite viruses and virophages (Murant and Mayo, 1982; La Scola et al., 2008). It is worth noting that the exact nature of interaction between satellite and helper viruses, or between virophages and their associated viruses, is still a matter of debate, and this association between two phages previously thought to be autonomous and independent (Microviridae and Caudovirales) presents a new variation on this theme (Desnues and Raoult, 2012; Krupovic and Cvirkaite-Krupovic, 2012; Fischer, 2012). Because the modular theory of phage evolution postulates that phage genomes consist of collections of gene modules, exchanged through proximity-enhanced recombination (Hendrix et al., 2000) such co-infection of a single host by ssDNA and dsDNA phages provides evidence for how such chimeric ssDNA–dsDNA viral genomes may come into existence (Diemer and Stedman, 2012; Roux et al., 2013). To extend our analysis of SUP05 virus–host interactions beyond individual SAGs, we used the 12 reference viral contigs (i.e., the 4 Caudovirales and 8 Microviridae) as platforms to recruit 3 years of Saanich Inlet microbial metagenome sequences spanning the redoxcline (Figure 3, Supplementary file 5). SUP05 Microviridae contigs were inconsistently detected due to known methodological biases associated with linker-amplified metagenome library construction (‘Materials and methods’), so we focused on dsDNA viral contigs. All 4 SUP05 Caudovirales contigs were absent from surface waters, but repeatedly detected within and below the oxycline, consistent with SUP05 water column disposition (Figure 3A—figure supplement 1). Within the Caudovirales, recruited microbial metagenome sequences were more similar to the reference genome for Podoviridae contigs C22_13 and K04_0 (96% average amino-acid identity), than for Siphoviridae G10_6 and Podoviridae M8F6_0 (92% average amino-acid identity, Figure 2B). Beyond sequence variation, metagenome coverage in one region of M8F6_0 (3 hypothetical open reading frames) was absent in 2009, minimal in 2010, and as abundant as surrounding genomic regions in 2011 (Figure 3C), suggesting a selective sweep within this population. Contig-derived abundances of SUP05-Caudovirales were in sync with host distributions, but at virus-to-host ratios of 0.01 to 0.3 (Figure 4). While tightly choreographed virus–host abundance dynamics parallels that of cultured virus–host systems (e.g., cyanophages—[Waterbury and Valois, 1993]), the systematically lower (orders of magnitude lower than typical community measurements) virus-to-host ratios observed here indicates that a greater diversity of SUP05 viruses remains to be uncovered in the Saanich Inlet water column. Spatiotemporal dynamics of SUP05 viral reference genomes in Saanich Inlet. (A) SUP05 viral presence in Saanich Inlet microbial metagenomes with OMZ sample names bolded. Four categories indicate the SUP05 virus was detected (>75% of viral genes detected at >80% amino-acid identity; light blue), a SUP05 viral relative was detected (>75% of viral genes detected at 60–80% amino-acid identity; light green), no SUP05 virus was detected (red) or detection was inconclusive (e.g., Microviridae in HiSeq Illumina data sets that strongly select against ssDNA sequences; gray). 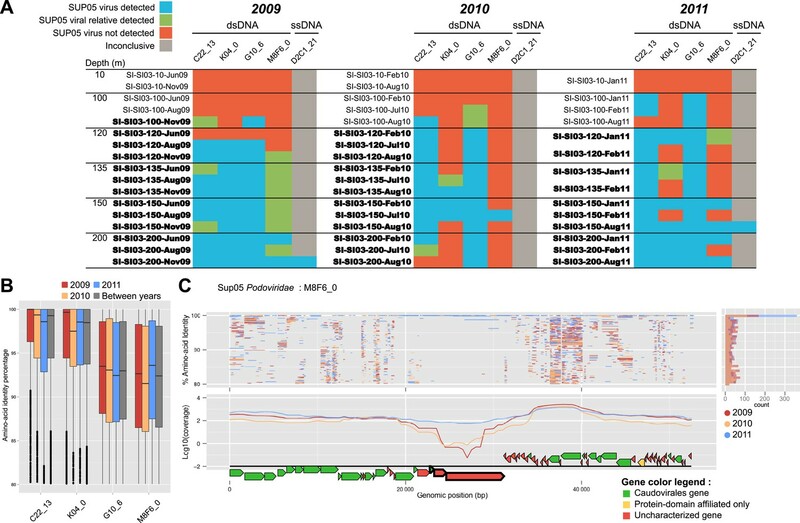 (B) SUP05 viral reference genomes had differing sequence conservation among recruited metagenomic reads. Upper and lower ‘hinges’ correspond to the first and third quartiles (the 25th and 75th percentiles), while outliers are displayed as points (values beyond 1.5 * Inter-Quartile Range of the hinge). (C) One SUP05 viral reference genome with low sequence conservation revealed evolution in action whereby a genomic region (see ∼21–30 kb) appears to sweep through the population. Uncultivated SUP05 lineage-specific virus–host ecology. Fragment recruitment from Saanich Inlet microbial metagenomes to microbial (95% nucleotide identity) and viral (100% amino-acid identity) reference contigs normalized by contig and metagenome size was used as a proxy for abundance. Hence, the relative abundance of microbial and viral genome is indicated as number of metagenomic bases recruited by contig(s) base pairs (bp) by megabase (Mb) of metagenome. Upper and lower ‘hinges’ of the relative abundance distribution correspond to the first and third quartiles (the 25th and 75th percentiles), while outliers are displayed as points (values beyond 1.5 * Inter-Quartile Range of the hinge). A virus-to-host ratio was then calculated for each SAG (i.e., each virus-host pair) as the ratio of relative abundance of viral contigs to the relative abundance of microbial contigs from the same SAG. To determine SUP05 viral biogeography, we interrogated 74 viromes and 112 microbial metagenomes sourced from Pacific Ocean waters (Supplementary file 5). Despite consistently recovering SUP05 viral sequences in Saanich Inlet, these sequences were extremely uncommon in other locales (22 instances out of 803 possibilities; Figure 3—figure supplements 2 and 3), even when proximal to Saanich Inlet (e.g., northeastern subarctic Pacific [NESAP] coastal and open ocean waters along the LineP transect) or when sourced from similar water column conditions (e.g., Eastern Tropical South Pacific OMZ, ETSP). Of the 22 SUP05-related viruses detected, all but two were recovered below 500 meters in NESAP OMZ samples, in which SUP05 bacteria were also detected with similar abundance as in Saanich Inlet samples. The remaining two detections derived from an ETSP OMZ virome and a hydrothermal vent plume microbial metagenome from the Guaymas basin. Taken together, these observations point to endemic SUP05 viral populations with the potential to modulate SUP05-mediated biogeochemical cycling via lysis or metabolic reprogramming. Recent studies have highlighted the role of viruses in metabolic reprogramming, from global photosynthesis (Mann et al., 2003; Lindell et al., 2005; Clokie et al., 2006; Sullivan et al., 2006; Sharon et al., 2009) to central carbon metabolism (Sharon et al., 2011; Thompson et al., 2011; Hurwitz et al., 2013) via auxiliary metabolism genes (AMGs). Additionally, viruses assembled from microbial metagenomes from SUP05 dominated hydrothermal vent samples contain sulfur cycling genes (Anantharaman et al., 2014). Therefore, we looked for AMGs encoded on SUP05 viral contigs in the Saanich Inlet water column. Four putative AMGs were detected in 12 of the 69 viral contigs, predominantly from SUP05_01 SAGs recovered from 150 meters (Supplementary file 6). One AMG identified on a bona fide viral contig, phosphate-related phoH, is common among marine phages, but remains functionally uncharacterized (Sullivan et al., 2010; Goldsmith et al., 2011). The remaining 3 AMGs including 2-oxoglutarate (2OG) and Fe(II)-dependent oxygenase superfamily (2OG-FeII oxygenase), tripartite tricarboxylate transporter (tctA, protein domain hit only), and dissimilatory sulfite reductase subunit C (dsrC) were encoded on contigs identified by non-reference-based methods. In marine cyanophages, 2OG-FeII oxygenase-encoding genes are common where they are thought to modulate host nitrogen metabolism during infection (Sullivan et al., 2010). However, the precise metabolic role of tctA and dsrC-like genes during viral infection remains unknown. Given that dsrC was found on 7 SUP05_01 viral contigs (Supplementary file 7) and DsrC is critical in SUP05 energy metabolism (Walsh et al., 2009), we focused on this gene. Although dsrC genes were only present on contigs identified by non-reference-based methods they were closely related to dsrC-like genes encoded on the hydrothermal vent plume phages (Anantharaman et al., 2014). Indeed, conceptually translated sequence alignment of these viral dsrC genes including putative viral and bacterial genes from microbial metagenomic data sets indicate that the Saanich Inlet 'viral' sequences belong to one dsrC subgroup (dsrC_1 according to the classification of Anantharaman et al., 2014). In addition to high sequence similarity viral dsrC genes from SUP05 SAGs co-localized on contigs with viral homologs (e.g., 2OG-FeII oxygenase, chaperonin), and occurred in genomic context that was completely different to the conserved and well-characterized dsrC region in SUP05 genomes (Figure 5A,B). (A) Seven contigs including dsrC-like gene detected as viral based on non-reference metrics (ratio of uncharacterized genes, strand coding bias). 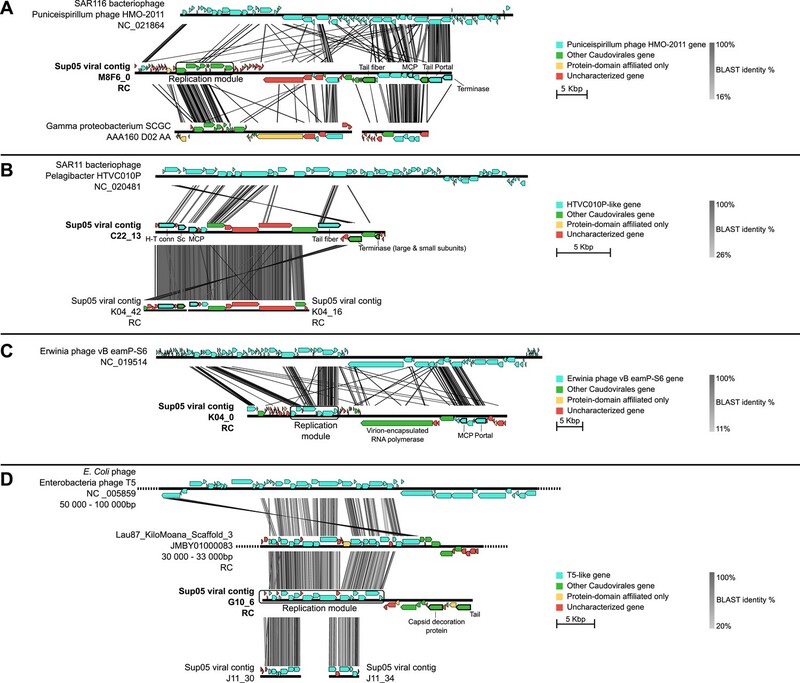 (B) Genomic context in which dsrC-like genes are retrieved in SUP05 microbial contigs from SAG. All contigs above 50 kb containing a dsrC-like gene were selected and compared to get a summary of the different regions in which dsrC-like genes are found in SUP05 genomes. (C) Map of dsrC-containing Contigs assembled from Saanich Inlet metagenomes. One viral-like contig from SAG (020_11) is included for comparison. The dsrC_1 group encodes a protein retaining 15 conserved residues across known DsrC subunits. However, the second C-terminal cysteine and a 7–8 residue insertion thought to be required for DsrC function based on structural analysis of Desulfovibrio vulgaris and Archaeoglobus fulgidus proteins are missing from the viral protein (Figure 5—figure supplement 1; Mander et al., 2005; Oliveira et al., 2008). These differences suggest that either the viral encoded dsrC is non-functional or has a modified function. Given that genes shared between different viral genomes rarely represent nonfunctional genes, it is likely that viral-encoded dsrC plays a biological role in SUP05. Indeed, there is precedent for divergent viral AMGs serving as modified functional counterparts to host-encoded homologues. Specifically, a highly divergent viral ‘pebA’ (Sullivan et al., 2005) was experimentally demonstrated to perform the functions of two host enzymes' (pebA and pebB) as a bifunctional enzyme, phycoerythrobilin synthetase (pebS) (Dammeyer et al., 2008). Given that viral dsrC genes were abundant in the Saanich Inlet water column over a 3-year-time interval (Figure 5C) with peaked recovery consistent with blooming SUP05 populations (Figure 5—figure supplement 2; Hawley et al., 2014), we posit that this viral gene is functional in SUP05 sulfur cycling. Future functional characterization of viral DsrC is needed to constrain viral roles in modulating SUP05 electron transfer reactions during viral infection in the environment. While new methods and model systems for identifying virus–host interactions continue to emerge (Tadmor et al., 2011; Allers et al., 2013; Mizuno et al., 2013; Deng et al., 2014), viral ecology remains predominantly community focused in nature. This is because most hosts are uncultivated (Rappé and Giovannoni, 2003), and culture-independent viral metagenomes are dominated by ‘unknown’ sequences (Hurwitz and Sullivan, 2013), which inhibits developing a mechanism- and population-based viral ecology. Here, we use single-cell genomics to directly link SUP05 viruses and their hosts across defined gradients of oxygen and sulfide over a 3-year-time interval in a model OMZ ecosystem. This spatiotemporal resolution revealed endemic patterns of co-infection between ssDNA and dsDNA viruses and the occurrence of AMGs with the potential to modulate electron transfer reactions essential to SUP05 energy metabolism. Together, these findings offer novel perspectives on the ecology and evolution of viruses infecting uncultivated bacterial populations. While the capacity to formulate such linkages between cultured virus–host systems in nature is recognized (e.g., cyanophages and pelagiphages), the use of single-cell genomics to explore such linkages in uncultivated microbial communities represents a watershed moment in illuminating viral dark matter and its role in modulating microbial interaction networks in natural and engineered ecosystems. Samples were collected in Saanich Inlet on Vancouver Island, British Columbia, on the 09th of August 2011. Sample collection and biochemical measurements were performed as previously described (Zaikova et al., 2010). Water column redox conditions were typical for stratified summer months when SUP05 populations bloom in deep basin waters. Individual cells <10 µm in diameter from 100, 150, and 185 meter depth samples were subjected to fluorescence-activated cell sorting, multiple displacement amplification (MDA), and taxonomic identification at the Bigelow Laboratory Single Cell Genomics Center (SCGC; http://scgc.bigelow.org), following previously described procedures (Stepanauskas and Sieracki, 2007; Swan et al., 2013). A total of 315 single amplified genomes (SAGs) per sample were subjected to multiple displacement amplification (MDA), and the taxonomic identity of single amplified genomes (SAG) was determined by directly sequencing bacterial small subunit ribosomal RNA (SSU rRNA) gene amplicons. A total of 136 SAGs affiliated with SUP05 or Arctic96BD-19 were selected for genome sequencing. Between 1 and 3 µg of MDA product was sent to Canada's Michael Smith Genome Sciences Center (Vancouver, BC) to create shotgun libraries. Briefly, the DNA was sheared to 350–450 bp fragments using a Covaris E210 and purified using AMPure XP Beads according to the manufacturer's instructions. The sheared DNA was end-repaired and A-tailed according to the Illumina standard PE protocol and purified again using AMPure XP Beads, generating paired-end 100-bp reads. Indexed libraries were amplified by PCR for six cycles, gel-purified, pooled (11–12 samples per lane), and QC assessed on a Bioanalyzer DNA Series II High Sensitivity chip (Agilent, Santa Clara, CA, USA), and then sequenced using an Illumina HiSeq2000 sequencer. All raw Illumina sequence data were passed through DUK, a filtering program developed at JGI, which removes known Illumina sequencing and library preparation artifacts (Mingkun, Copeland, and Han, Unpublished). Artifact filtered sequence data were then screened and trimmed according to the k-mers present in the data set (Mingkun and Kmernorm, Unpublished). High-depth k-mers, presumably derived from MDA amplification bias, cause problems in the assembly, especially if the k-mer depth varies in orders of magnitude for different regions of the genome. Reads with high k-mer coverage (>30× average k–mer depth) were normalized to an average depth of 30×. Reads with an average k-mer depth of less than 2× were removed. Following steps were then performed for assembly: (i) normalized Illumina reads were assembled using IDBA–UD version 1.0.9 (Peng et al., 2012); (ii) 1–3 kb simulated paired end reads were created from IDBA–UD contigs using wgsim (https://github.com/lh3/wgsim); (iii) normalized Illumina reads were assembled with simulated read pairs using Allpaths–LG (version r42328) (Gnerre et al., 2011); (iv) Parameters for assembly steps were: (i) IDBA–UD (––no local), (ii) wgsim (–e 0 –1 100 –2 100 –r 0 –R 0 –X 0), (iii) Allpaths–LG (PrepareAllpathsInputs: PHRED 64=1 PLOIDY=1 FRAG COVERAGE=125 JUMP COVERAGE=25 LONG JUMP COV=50, RunAllpathsLG: THREADS=8 RUN=std shredpairs TARGETS=standard VAPI WARN ONLY=True OVERWRITE=True MIN CONTIG=2000). SAG taxonomy was verified using the assembled contigs in two ways using MetaPathways 1.0 (Konwar et al., 2013). First, the assemblies were blasted against the SILVA (v.111) database to confirm the taxonomy based on SSU rRNA. Next, MEGAN5 was used to carry out taxonomic binning of all ORFs from the MetaPathways BLAST output using the Lowest Common Ancestor (LCA) approach (Huson et al., 2007). A total of 2711 SSU rRNA sequences previously taxonomically assigned to SUP05 and Arctic96BD-19 lineages were aligned and clustered using mothur v.1.27.0 (Schloss et al., 2009), and 20 representative sequences for the most abundant clusters (cutoff = 6) at 97% similarity were selected. These representative sequences were used to build the phylogenetic tree differentiating between SUP05 and Arctic96BD-19. Reference SUP05 and Arctic96BD-19 sequences from different environments and symbionts and cluster representative sequences were aligned using the SILVA aligner tool (http://www.arb-silva.de/aligner/) and imported into an in-house ARB database for SUP05. Aligned sequences were exported from ARB into Mesquite for manual alignment refinement. The final phylogenetic tree was inferred from manually refined Mesquite alignment of sequences using maximum likelihood implemented in PHYML using a GTR model with estimated values for the α parameter of the Γ distribution and the proportion of invariable sites. The confidence of each node was determined by assembling a consensus tree of 1000 bootstrap replicates. The protocols used to generate the POV (Hurwitz and Sullivan, 2013), ETSP OMZ viromes (Cassman et al., 2012), ETSP microbial metagenomes and metatranscriptomes (Stewart et al., 2012; Ganesh et al., 2014), and Guaymas basin metagenome (Anantharaman et al., 2013) are described in their respective publications. All these data sets were sequenced with Roche 454 GL FLX Titanium systems, and quality controlled reads were used in the different analysis computed in this study. LineP and Malaspina viral metagenomes (viromes) were obtained from samples collected during LineP (http://www.pac.dfo-mpo.gc.ca/science/oceans/data-donnees/line-p/index-eng.html) and Malaspina (http://scientific.expedicionmalaspina.es/) cruises. Particles were precipitated with Iron–Chloride from 0.2 µm filtrates, and resuspended in EDTA-Mg-Ascorbate buffer (John et al., 2011) before the DNA was extracted using Promega's Wizard Prep kit. Assembly and gene prediction were conducted through the IMG/M ER pipeline (Markowitz et al., 2014). Microbial metagenome samples at Saanich Inlet and along the LineP transect were also collected during LineP cruises (http://www.pac.dfo-mpo.gc.ca/science/oceans/data-donnees/line-p/index-eng.html). Sequencing and assembly of these data sets was conducted at the JGI. A list of the different web servers and accession numbers for these publicly available data sets is displayed in Supplementary file 5. SUP05 SAG contigs were annotated with the Metavir web server (Roux et al., 2014). Briefly, ORFs were predicted with MetaGeneAnnotator (Noguchi et al., 2008) and compared to the RefseqVirus database with BLASTp (Altschul et al., 1997). In order to select viral-associated contigs, we looked for viral-specific genes, that is, genes associated with the formation of the capsid and encapsidation of the genome (designated as ‘hallmark viral genes’). Thus, we searched for all genes annotated as ‘virion structure’, ‘capsid’, ‘portal’, ‘tail’, or ‘terminase’, and selected contigs including at least one of these hallmark genes (Supplementary file 1). Among the 50 viral contigs detected, we highlighted a set of 12 long (>15 kb) or circular contigs as the best references available for SUP05 phages (Supplementary file 1). We then compared the reference sequences retrieved in this first screening round to all the SUP05/Arctic96BD-19 SAG contigs, in order to extract more viral-related sequences (Supplementary file 1). At this step, all contigs with at least 50% of their genes similar to a previously detected SUP05 viral contigs were retained (sequence similarity between predicted genes assessed through BLASTp, thresholds of 0.001 for e-value and 50 for bit score). Alternatively, we compared the SUP05/Arctic96BD-19 SAG contigs to a set of ocean viromes (Supplementary file 5) and looked for every contig which was covered by virome reads (for 454-sequenced viromes) or predicted genes (for HiSeq-sequenced viromes) on at least three genes with at least 90% of identity (protein sequences). However, this comparison to viromes only highlighted contigs already identified as viral from the hallmark gene analysis. Finally, we looked for every sequence which could come from a new type of phage, based on two known properties of phage genomes: most of their genes are not similar to anything in the current databases, and they tend to be mostly coded on the same strand (by block, or module) (Akhter et al., 2012). We thus looked for all regions in SAG contigs composed of at least 50% of uncharacterized genes, with at least 80% of them on the same coding strand. 19 new short viral contigs were highlighted through this detection (Supplementary file 1), which displayed characteristics close to the viral hallmark contigs (Figure 1—figure supplement 3). A set of regions of putative viral origin within bacterial contigs also stood out. These sequences were manually curated to check if they could indeed be of viral origin, notably by checking if these regions were conserved between closely related bacterial contigs, and 13 putative defective prophages were eventually identified among them. CRISPR regions were detected with the CRISPR recognition tool (Bland et al., 2007). All spacers were extracted and compared to all SUP05/Arctic96BD-19 SAG contigs with BLASTn. The annotations of selected contigs were extracted from the Metavir web server (Roux et al., 2014) and manually curated. Taxonomic affiliations were based on a BLAST comparison to RefseqVirus and NR databases from NCBI, with a bit score threshold of 50 and e-value threshold of 0.001. A tBLASTx comparison of larger contigs (>15 kb) against WGS (Whole-Genome shotgun), HTGS (High-Throughput Genomic Shotgun), and GSS (Genomic Survey Sequences) from the NCBI was used to add the most closely related sequence to the analysis, which could have not been included in the NR and Refseq database yet. This screening notably lead to the detection of two contigs from a Gammaproteobacteria single-cell amplified genome (Gamma proteobacterium SCGC AAA160-D02) similar to SUP05 phage genome and was therefore included in the phylogenetic and genome comparison analysis. The affiliation of SUP05 viruses to new or existing genera was based on the criteria of 40% of genes shared within a genus previously defined for Caudovirales (Lavigne et al., 2008). Map comparison figures were created with Easyfig (Sullivan et al., 2011). Functional annotation was achieved through a domain search against the PFAM database (Punta et al., 2012) (hmmscan [Eddy, 2011], using a threshold of 0.001 for e-value and 30 for score). When looking for putative AMGs, defective prophages were not considered since these regions are likely to be subject to rearrangement and gene transfer, and the origin of single genes within these regions is uncertain. A set of microbial dsrC sequences were selected as references for SUP05 viral-encoded dsrC genes in genomic context (Figure 5B). Briefly, all contigs in SUP05 SAGs longer than 50 kb and containing a DsrC-like gene were compared through BLASTn and displayed with Easyfig (Sullivan et al., 2011). Maximum-likelihood trees were computed with PhyML (Guindon and Gascuel, 2003) using a LG model, a CAT approximation for Gamma parameter, and computing SH-like scores for node supports. All SUP05 contigs affiliated to Podoviridae and including the major capsid protein gene were added in a single tree alongside reference sequences from Autographivirinae and N4-like viruses. The most closely related sequences to each SUP05 Podoviridae, as detected from the genome comparison analysis, were also included in the tree. SUP05 Microviridae were included in a phylogenetic tree based on the Major Capsid protein and centered around the Gokushovirinae sub-family, with sequences from Pichovirinae used as outgroup. Gokushovirinae reference sequences were taken from Roux et al. (2012) and Labonté and Suttle (2013b). In order to include more aquatic sequences, complete Microviridae genomes were assembled from two sets of viromes sampled from a freshwater subtropical reservoir (Tseng et al., 2013) and deep-sea sediments (Yoshida et al., 2013) and annotated as previously described (Roux et al., 2012). Tree figures were drawn with Itol (Letunic and Bork, 2007). DsrC-like predicted protein sequences were aligned with Muscle v3.8.31 (Edgar, 2004), and the multiple alignment was displayed with Jalview (Waterhouse et al., 2009). A set of oceanic viromes and microbial metagenomes were used for comparison with SUP05 viral genomes (Supplementary file 5). Similarities between SUP05 viral genomes and published viromes were assessed through BLAST comparison, BLASTx for 454-sequenced viromes (POV data set [Hurwitz and Sullivan, 2013], ETSP OMZ viromes [Cassman et al., 2012], ETSP microbial metagenomes and metatranscriptomes [Ganesh et al., 2014; Stewart et al., 2012], and Guaymas basin metagenome [Anantharaman et al., 2013]) and BLASTp from predicted protein for HiSeq-sequenced viromes (LineP and Malaspina viromes, Saanich Inlet and LineP microbial metagenomes), with similar thresholds of 0.001 for e-value and 50 for bit score. Each metagenome—viral genome association was classified based on the number of viral genes detected and the amino-acid percentage identity of the BLAST hits associated: when more than 75% of the genes were detected at more than 80% identity in the metagenome, the viral genome was thought to be in the sample. The same ratio of genes detected at lower percentage (60 to 80%) indicates the presence of a related but distinct virus. We considered that less than 75% of the genes detected meant that this virus was likely absent from the sample. The results of Microviridae detection with the HiSeq Illumina data sets have to be carefully considered, as the linker amplification used in the preparation of samples for HiSeq Illumina sequencing displays a strong bias against ssDNA templates such as Microviridae genomes (Kim and Bae, 2011). Hence, if the detection of SUP05 Microviridae in HiSeq Illumina data sets undoubtedly testifies for the presence of these viruses in the samples, an absence of detection is not a strong indicator of their absence in the sample. In order to detect the host of SUP05 viruses in the same data sets, a mapping of all sequences from each metagenome to non-viral SAG contigs was computed with mummer (Delcher et al., 2003) (minimum cluster length of 100, maximum gap between two matches in a cluster of 500). The Saanich Inlet SUP05 bacteria is considered present in the metagenome when more than 75% of genes are covered by metagenomic sequences with average nucleotide identity above 95%. Viral-encoded dsrC was computed with a threshold of 95% on average nucleotide identity, as no similarity beyond 80% average nucleotide identity was detected between viral and microbial homologues, whether from public database or from the SUP05 SAG microbial contigs. All recruitment and coverage plots were drawn with the ggplot2 module of R software (Wickham, 2009). Assessment of variability in the populations associated with each SUP05 virus was based on a BLASTp between all sequences from Saanich Inlet metagenomes recruited by each SUP05 viral contig (thresholds of 50 for bit score, 0.001 for e-value, and 80% for amino-acid identity). The relative abundance of SUP05 viral and microbial genomes was assessed from the recruitment of Saanich Inlet metagenomic reads to each viral contig and set of microbial contigs (all contigs greater than 5 kb and not identified as viral) for each ‘reference’ SAG (i.e., the 4 SAG in which a SUP05 reference Caudovirales was detected: AB-750C22AB-904 for C22_13, AB-750K04AB-904 for K04_0, AB-751_G10AB-905 for G10_6, and AB-755_M08F06 for M8F6_0, Figure 2—source data 1). For each metagenome, a normalized ratio of nucleotides recruited by each contig or set of contigs was calculated as the number of bases recruited (sum of the length of recruited reads) divided by the total number of bases in the (set of) contig(s) and the total number of bases in the metagenome. The ratio of viral genomes to host genomes was then calculated for each metagenome as the relative abundance of viral contig divided by the relative abundance of bacterial contig from the same SAG. The plots of genetic variability and relative abundance distributions were generated with the ggplot2 module of R software (Wickham, 2009). The perl scripts used in the different part of the bioinformatics analyses are available online at http://tmpl.arizona.edu/dokuwiki/doku.php?id=bioinformatics:scripts:sup05 and as Source code 1. Advances in Applied Microbiology, Elsevier, 1st edition, Vol. 67, 10.1016/S0065-2164(08)01001-0. Annual Review of Biochemistry 81:795–822. Proceedings of the National Academy of Sciences of USA 110:330–335. 16–48, Association for the Sciences of Limnology and Oceanography, Eco-Das IX, 10.4319/ecodas.2014.978-0-9845591-3-8.16. Chapter 10: Unit 10.3, 10.1002/0471250953.bi1003s00. 234, Nature Reviews Microbiology, 10, author reply 234, 10.1038/nrmicro2676-c3. 78, Nature Reviews Microbiology, 10, author reply 78, 10.1038/nrmicro2676-c1. Proceedings of the National Academy of Sciences of USA 105:3805–3810. Proceedings of the National Academy of Sciences of USA 108:1513–1518. Applied and Environmental Microbiology 77:7730–7739. Proceedings of the National Academy of Sciences of USA 111:11395–11140. Applied and Environmental Microbiology 77:7663–7668. Proceedings of the National Academy of Sciences of USA 106:4752–4757. Annual Review of Phytopathology 20:49–70. The Journal of Biological Chemistry 283:34141–34149. Annual Review of Microbiology 57:369–394. Proceedings of the National Academy of Sciences of USA 104:9052–9057. Proceedings of the National Academy of Sciences of USA 110:11463–11468. Proceedings of the National Academy of Sciences of USA 108:E757–E764. Proceedings of the National Academy of Sciences of USA 109:15996–16003. Applied and Environmental Microbiology 59:3393–3399. ggplot2: elegant graphics for data analysis, Springer Publishing Company. Thank you for sending your work entitled “Cultivation-independent exploration of SUP05 virus-host interactions in a model Oxygen Minimum Zone” for consideration at eLife. Your article has been favorably evaluated by Ian Baldwin (Senior editor) and 3 reviewers, one of whom is a guest Reviewing editor. All 3 reviewers agree that Roux et al. present a fascinating, multifaceted study of high quality that analyses the viral community of a group of as yet uncultivable bacteria called SUP05 using single-cell amplified genome (SAG) sequencing. SUP05 are highly abundant in marine oxygen minimum zones (OMZ), areas of the ocean that are expanding and associated with the generation of greenhouse gases. Given that viruses can have a major effect on microbially driven carbon, nitrogen and sulfur transformations, improving our knowledge of viruses associated with SUP05 is critical for a better understanding of OMZs and their effects on marine biogeochemical processes. Roux et al sequenced SUP05 cells from three different water depths across the chemocline, allowing them to draw inferences about infection rates as a function of water column geochemistry. Major results include the first estimate for viral infection rates in free-living bacteria from the environment (as high as 33%), host-specific identification of viruses in an environmental sample, co-infection of hosts by ssDNA and dsDNA viruses, the presence of auxiliary metabolic genes including dsrC (involved in sulfur oxidation), and increases in viral infection frequencies with water depth and oxygen deficiency. 1) Since this paper was submitted, a paper describing viruses that infect SUP05 in deep-sea hydrothermal plumes was published by Anantharaman et al. (Science 344: 757). These two papers are quite distinct in their approach, field site, and results, so the Anantharaman et al. study does not diminish the impact of the current manuscript. However, both the common themes (auxiliary metabolic genes (dsrC); some shared taxa) as well as differences (no dsrA in this paper; some differences in taxa identified) should be discussed. 2) The paper provides a large quantity of data and covers the topic well; however a more general discussion and a little less method in the main text region is needed. There is no attempt to compare the findings to other viral data from OMZ's or marine environments in general. 3) The weakest part of this paper is the section on auxiliary metabolism genes (AMGs). While this is only a side aspect of this paper, it is important that it be addressed. In both this submission and the Anantharaman et al. paper, the annotation of the DsrC protein is problematic: DsrC is a short protein and has homologs that are very likely not involved in sulfur oxidation by rDSR or sulfur reduction by DSR, such as TusE, which is involved in thiouridine biosynthesis. Anantharaman et al. identified two groups of rDsrC, but only one (their “rdsrC2 group”) has the residues that are most likely needed for the protein to function as rDsrC. The sequences in their second group (“rdsrC1”) do not share the seemingly characteristic signatures with any of the proteins TusE, rDsrC, and DsrC (“rdsrC1” sequences lack both the 2nd c-terminal cysteine and the 7-8 residue insertion). The neighboring genes for the first three sequences from the second group (“rdsrC1”) do not have any (r)DSR-related genes. Instead, there is an annotated ”thiamine biosynthesis gene”. The DsrC homologs of the ”rdsrC1 group” might therefore be homologs with a completely different function. We would therefore like the authors to reanalyze the DsrC genes they found, e.g. by aligning them with bona fide DsrC genes and those from the Anantharaman et al. study. This is particularly interesting because the “viral” DsrC apparently occurred in a completely different genomic context than the DsrC of the host and seems to be “relatively divergent from the host version”. 4) We were not convinced by the authors' statements that they were able to show “viral metabolic reprogramming”, “virus-host co-evolution dynamics”, and reactions that “fuel SUP05-mediated nitrogen loss and inorganic carbon fixation pathways with resulting feedback on climate active trace gas cycling in OMZ waters with real world implications for biogeochemical models.” Evidence for metabolic reprogramming (such as expression of the relevant proteins and physiological data showing the effects of reprogramming), co-evolution (e.g. phylogenetic analyses and statistical tests for co-evolution), and effects of SUP05 phages on nitrogen and carbon cycles is needed to provide support for these unnecessary inflationary statements. We re-analyzed our contigs and dsrC-like genes in light of the Anantharaman et al. manuscript, and added the relevant comparisons through the manuscript (Figure 2–figure supplement 1 and Figure 5–figure supplement 1). Overall, phylogenetic and synteny analysis revealed that our SUP05 phages are quite different from the one highlighted in the Anantharaman manuscript (probably due to the fact that hydrothermal vent SUP05 are distinct from OMZ SUP05). As the reviewers pointed out, the most informative comparative analysis concerned the dsrC AMG (detailed in response to question 3). We added a paragraph of more general introduction about other OMZ's and marine viral communities, and our results were put into the context of known OMZ viruses. We found that, in accordance with previous metagenomics studies, OMZ viruses are clearly distinct from other marine viral communities, notable from the surrounding surface and deep-sea waters. However, our SUP05 Microviridae are the first example of this family in an OMZ. 3) The weakest part of this paper is the section on auxiliary metabolism genes (AMGs). While this is only a side aspect of this paper, it is important that it be addressed. In both this submission and the Anantharaman et al. paper, the annotation of the DsrC protein is problematic: DsrC is a short protein and has homologs that are very likely not involved in sulfur oxidation by rDSR or sulfur reduction by DSR, such as TusE, which is involved in thiouridine biosynthesis. Anantharaman et al. identified two groups of rDsrC, but only one (their ”rdsrC2 group”) has the residues that are most likely needed for the protein to function as rDsrC. The sequences in their second group (“rdsrC1”) do not share the seemingly characteristic signatures with any of the proteins TusE, rDsrC, and DsrC (”rdsrC1” sequences lack both the 2nd c-terminal cysteine and the 7-8 residue insertion). The neighboring genes for the first three sequences from the second group (“rdsrC1”) do not have any (r)DSR-related genes. Instead, there is an annotated “thiamine biosynthesis gene”. The DsrC homologs of the “rdsrC1 group” might therefore be homologs with a completely different function. We would therefore like the authors to reanalyze the DsrC genes they found, e.g. by aligning them with bona fide DsrC genes and those from the Anantharaman et al. study. This is particularly interesting because the ”viral” DsrC apparently occurred in a completely different genomic context than the DsrC of the host and seems to be “relatively divergent from the host version”. The DsrC genes were re-analyzed and compared to both microbial sequences and the new viral DsrC from the Anantharaman et al. study. This lead to a new supplemental figure (Figure 5–supplement figure 1), and an addition to the AMG paragraph. We found out that the dsrC genes in our OMZ SUP05 phages corresponded to one of the two categories described in the Anantharaman et al., category with an incomplete set of conserved residues which suggest a modified role for these genes (beyond sulfur reduction). These statements were softened in the revised manuscript. However, we prefer to keep some notion of “virus-host co-evolutionary dynamics” as we believe the environmental genomic analyses of 186 microbial and viral metagenomes using these novel phage genome references offers an unprecedented time series analysis in nature. This revealed the SUP05 dsrC link, where the hosts of these viruses are known (contrast to the Anantharaman paper), and helped document “evolution in action” of one of the phage genomes as well as remarkable conservation of the other (Figure 3) – both of which are new and unique observations for environmental phages, so we hope worth being emphasized in the Abstract. We thank the crew aboard the MSV John Strickland for logistical and sampling support in Saanich Inlet and Melanie Scofield, Jody Wright, Evan Durno, and Elena Zaikova in the Hallam lab for technical assistance. We also thank the Joint Genome Institute, including IMG and GOLD teams and Sussanah Tringe, Stephanie Malfatti, and Tijana Glavina del Rio for technical and project management assistance. This work was performed under the auspices of the U.S. Department of Energy Joint Genome Institute supported by the Office of Science of the U.S. Department of Energy under Contract No. DE-AC02-05CH11231; the G Unger Vetlesen and Ambrose Monell Foundations and the Tula Foundation funded Centre for Microbial Diversity and Evolution, Natural Sciences and Engineering Research Council (NSERC) of Canada, Canada Foundation for Innovation (CFI), and the Canadian Institute for Advanced Research (CIFAR) through grants awarded to SJH; and BIO5, NSF (OCE-0961947) and the Gordon and Betty Moore Foundation (#3790) through grants awarded to MBS. This work was supported by the University of Arizona, Technology and Research Initiative Fund, through the Water, Environmental and Energy Solutions Initiative. Single cell genomics instrumentation at Bigelow Laboratory for Ocean Sciences was supported by NSF grants OCE-821374 and OCE-1019242 to RS and by the State of Maine Technology Institute. The single cell genome sequences and annotations can be accessed via IMG (img.jgi.doe.gov, SAG Ids are listed in Supplementary file 4). Viral contigs and defective prophages identified in the SUP05 SAG are available on the Metavir webserver (http://metavir-meb.univ-bpclermont.fr/), as virome ‘SUP05_viral_sequences’ in project ‘SUP05_SAGs’. The web servers hosting viral and microbial metagenome sequences used here are listed in Supplementary file 5. © 2014, Roux et al.